With a degree in Architecture from IUAV in Venice, Luca went on to specialise in design and museography, attending master’s programmes and advanced training courses at Politecnico di Milano, IED in Florence, the Lighting Academy, and Università Cà Foscari in Venice. 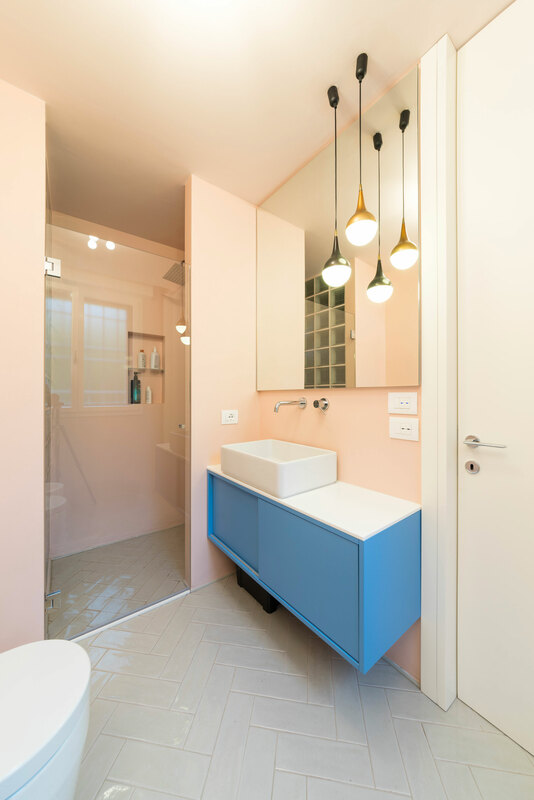 His studio based in Padua takes care of all aspects of architecture and design from concept to final delivery, drawing on the skills of a network of professionals, craftspeople and enterprises selected to provide an efficient response to clients’ aesthetic and practical requirements. The studio’s research on the micro and macro scale reinterprets and blends different fields of study: from architecture to interior design, from museums to hotels, from graphics to decoration, and from furniture to lighting, creating innovative spaces and objects that tell stories and arouse emotions. 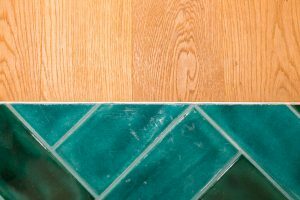 What where your objectives when you chose the materials to be used for your floor or wall coverings? 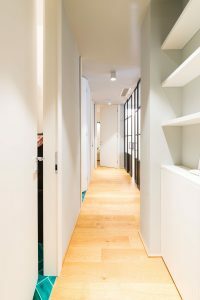 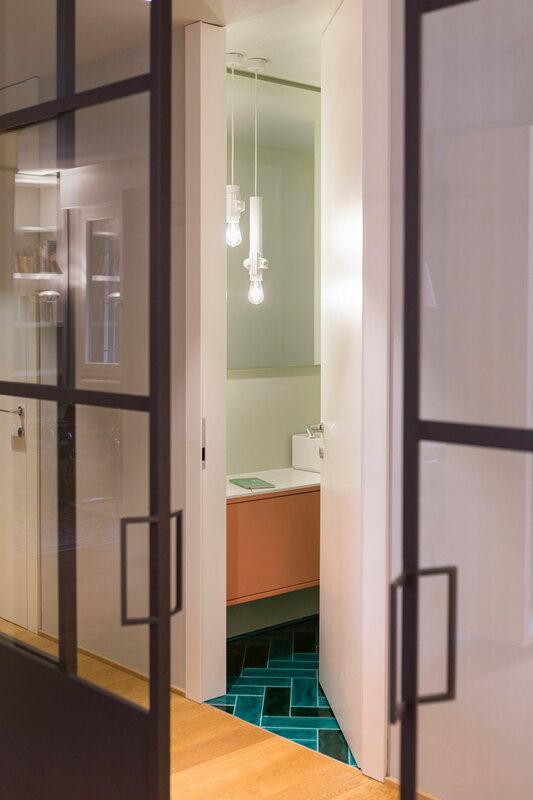 Our intention was to improve the quality of the floors and some of the walls in the bathrooms with a material that would have a vibrant effect, colourful but not too high-impact, permeated by a vague reference to the past. 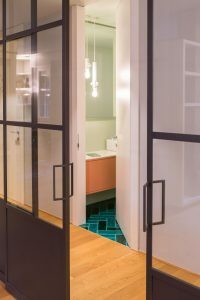 We also liked the elegant contrast between the floors in the bathrooms and corridors, visible when the doors are open. 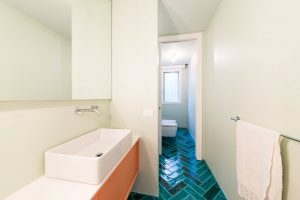 What made you chose the Tonalite products? 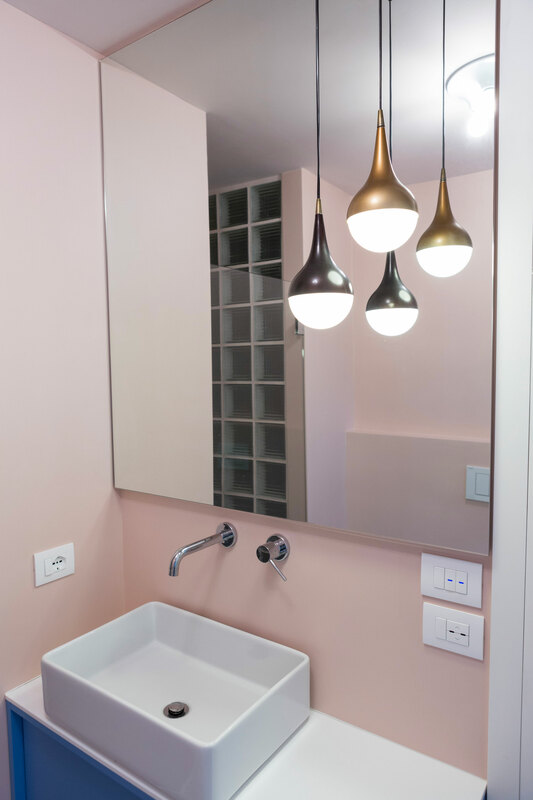 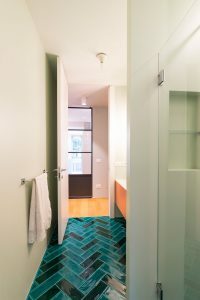 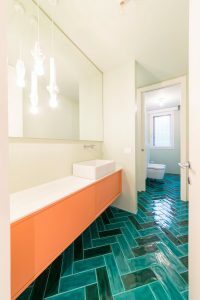 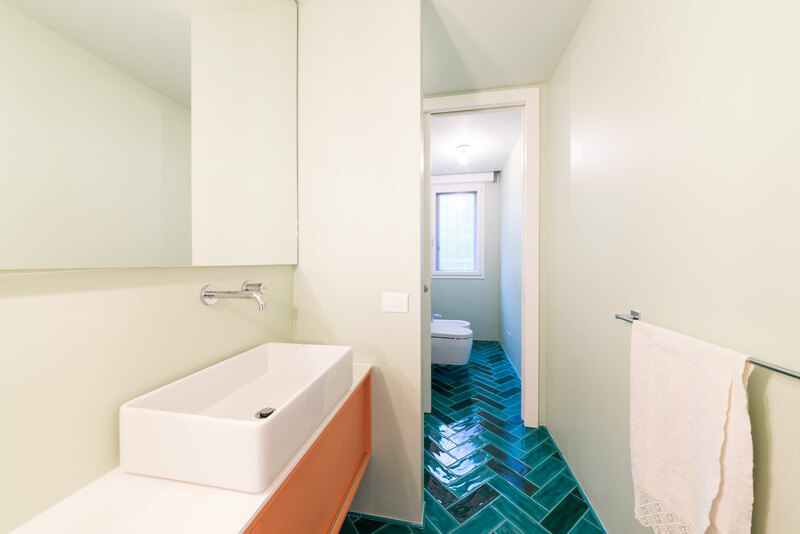 What struck us was the quality of the Kraklé finish, the variety of colours, the intensity of the hues and, above all, the 10×30 format that allowed us to create a herringbone texture in the floor (throughout the bathroom) and on the walls (in the showers), establishing continuity between horizontal and vertical surfaces. 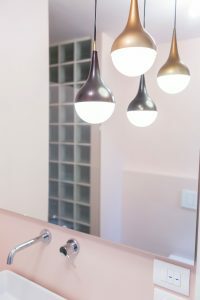 What colours and combinations did you chose and how did you use them? 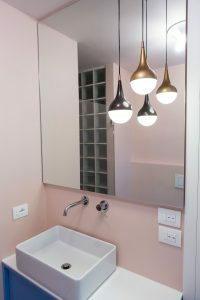 The choices of designs followed different styles and products, using the different proposals of the Kraklè collection. 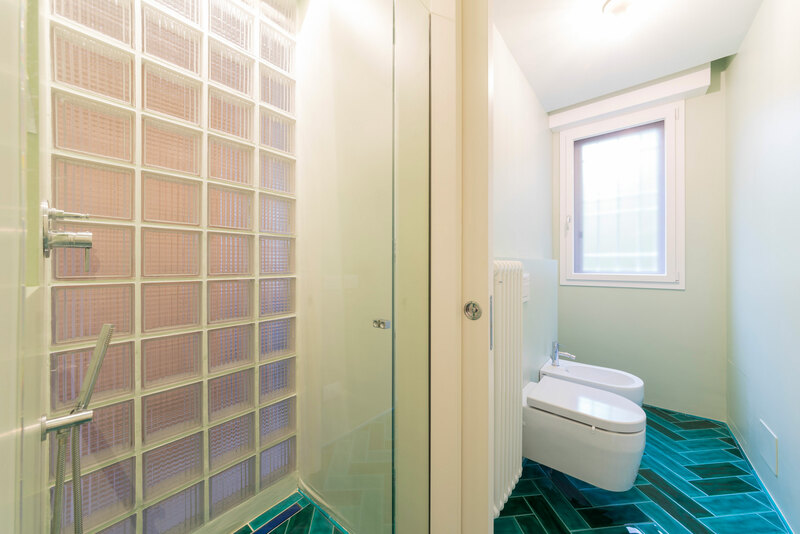 In bathroom one, we opted for a blend of bottle green and dark green in the 10×30 format. 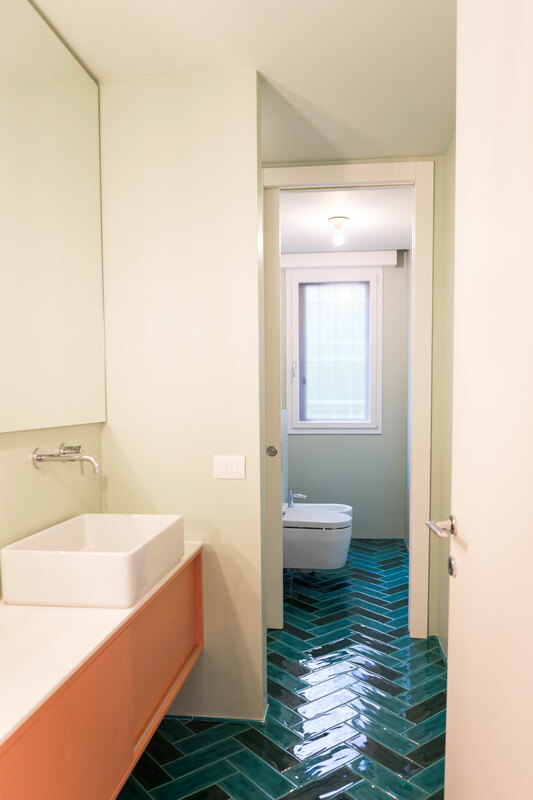 Perfect with mint green matt enamelled walls. We then used dark green bullnose tiles to create an almost imperceptible skirting board. 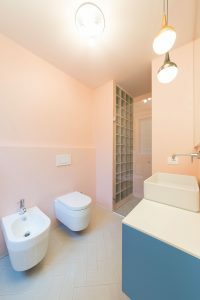 In the bathroom two, we opted for a white blend in the 10×30 format that goes perfectly with quartz pink walls. 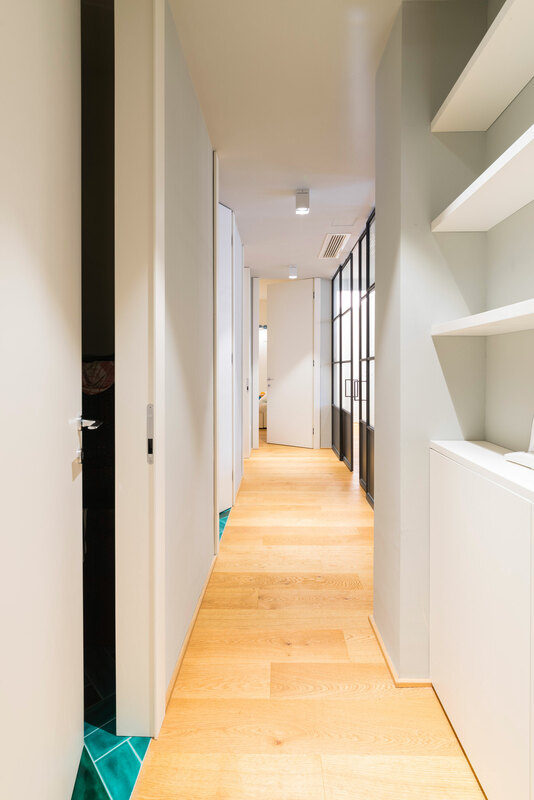 We used white bullnose tiles to create an almost imperceptible skirting board.